What are Katerno Reward Points? 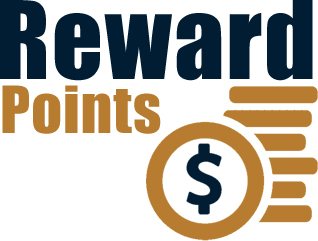 Katerno Reward Points are rewards earned from a making a purchase at Katerno.com. They can be redeemed on any purchase through Katerno.com for discounts on your next order. You can even get free products if you have enough points. They are essentially free money you can use to make purchases on Katerno.com. Simiply making a purchase will enable you to earn Reward Points. The amount you earn varies depending on the item you purchase. The product information page and shopping cart will show the total amount of points earned. How much money will I save using Reward Points? 100 Points would equal to $1 in savings. How are the number of points I get calculated? It is a percentage based on the total value of the item. However that percentage varies greatly from item to item it may be 1% upto 10% or more. Once you login to your account and go to your cart, You will have an option to redeem your points (if you have points in your account). You will also have a chance to redeem them at the order confirmation step during checkout. Is there a limit to how many points I can obtain? There is no limit you can have as many as you can earn. The reward points however expire after a year of inactivity. You will be notified if you are at risk of having your rewards expire. I just made a purchase, when will I see my points? Once the order is shipped and the tracking number is updated the points will be available for use. Some items take longer to ship then others please check the product page for details. Please note if the order is cancelled you will not recieve rewards points for that purchase. Can I use points if I use Paypal? Unfortunately not at this time. We are working on integrating Paypal with the rewards system but at this time you will not be able to use reward points or get rewards if you use paypal to checkout. You may not be eligible for reward points if you where provided a special price quote or a volume discount quote. Also Paypal checkout is not currently supported. *Please note if there is a technical issue that incorrectly distributes reward points, Katerno reserves the right to make any neccessary corrections. If you have any questions about reward points please email us at sales@katerno.com with your questions.